Yves Leterme is the secretary general of the International Institute for Democracy and Electoral Assistance (IDEA) and a former prime minister of Belgium. Governments, political parties and the public debate need to focus on both rights and responsibilities to overcome the challenges and seize the opportunities related to migration. In this context, important democratic elements such as citizenship, voting rights and political participation for migrants need to be considered in order to adhere to the basic democratic principles our countries are built upon. In many countries, migration is at the centre of public and political debate. It dominates electoral campaigns and has become the predominant differentiator for parties running for office, as seen in recent examples from Hungary, Italy, Austria and Germany. Amidst the polarising debates, it is important for democracies not to lose sight of the fundamental value of inclusion based on a balanced approach between rights and responsibilities. Discussions on rights and responsibilities regarding migration are intrinsically intertwined and symbiotic. Countries should guarantee migrants and refugees the rights outlined in international conventions, offer a safe haven from conflict and persecution and enable their pursuit of a better life. In turn, migrants bear the responsibility swiftly integrate into their new host societies. Essential for successful integration are the opportunities to access the labour market and contribute to society, to familiarise and adhere to host country values and build bridges to host and origin country nationals. Public authorities also have an important role to play in facilitating integration, by ensuring a fact-based public debate on the potential opportunities and challenges of migration, fighting discrimination and nationalism, as well as facilitating cultural, linguistic and labour market integration. International IDEA’s latest research also highlights the importance of political integration of migrants and refugees for both host and origin countries. Aside from contributing to a more accurate representation of the current population, the inclusion of migrants in political processes can help contribute to the achievement of more inclusive and sustainable societies, as envisaged in the SDG16. In addition, correlated data from the International IDEA GSoD Indices and the Migration Policy Index also suggests that inclusive political systems are linked to higher scores regarding the quality of democracy, contribute to conflict prevention and sustainable peace. 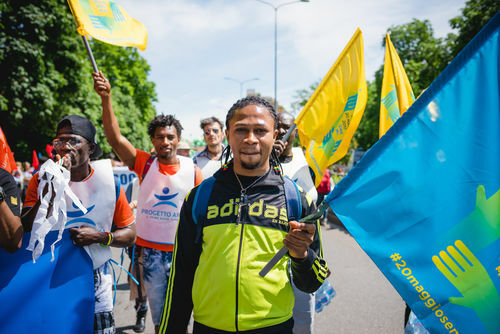 When given access to learn and participate in political processes, migrants have the potential to become democracy ambassadors who raise awareness and advocate for democratic reforms in their countries of origin. International IDEA’s 2018 study on the political participation of refugees, reinforces the advantages of inclusive migration policies for both host and origin countries. The study finds that members of the diaspora who participate in post-conflict elections as voters, candidates or supporters of political parties, form governments-in-exile and political movements and establish CSOs and transnational networks. Political integration and citizenship can be seen as an end goal to successful integration but also as a means for facilitating integration itself. Regardless of the order, successful integration can only be claimed when migrants have a right to vote and be voted for, but also exercise that right by actively taking part in elections and political life. To this end, political parties need to acknowledge migrants as potential candidates and civil society organisations need to be active in advocating migrants’ voices. These issues are neither easy or free from controversy, but a reality that we must embrace. We also need to continue the dialogue in both national, regional and international fora as well as through initiatives which include civil society and the private sector. Global migration is neither new nor nocive, but a fact. Through a balanced approach which focuses on both rights and responsibilities, respect for international conventions and local contexts, increased dialogue and participation we will be able to seize the opportunities that migration brings to our societies and our democracies. Immigrants must be deported due to illegal entrance in EU.